We will be having some indoor ultimate fun on December 20th. We will be starting at 4pm and going until 10pm. Its a Saturday evening and school is out so you have no excuses to be late or skip out. Make sure you tell everyone so we have good numbers and can have a bunch of teams and a great time. Everyone be on time, so we can get warmed up and start. We will as usual do a little potluck dinner at the end, so sign up in the google doc using the link below with what you will bring. Pizza is on the team. Jersey Deadline is Friday December 5, 2014! Once there you will select the items you want, fill in the information for guys/girls cut, size, and number, and pay. In order to make sure we don't have any duplicate numbers please talk to the girls and varsity captains they will compile a list and make sure all our new players get a number that isn't in use. The items every player needs are the short sleeve grey, short sleeve white, and shorts. All other items are extras you can order them if you would like, you will still match and be able to wear them in games, but they are not required. We would encourage everyone to get the compression shirt, they are great for cold weather which we spend a lot of time playing in. 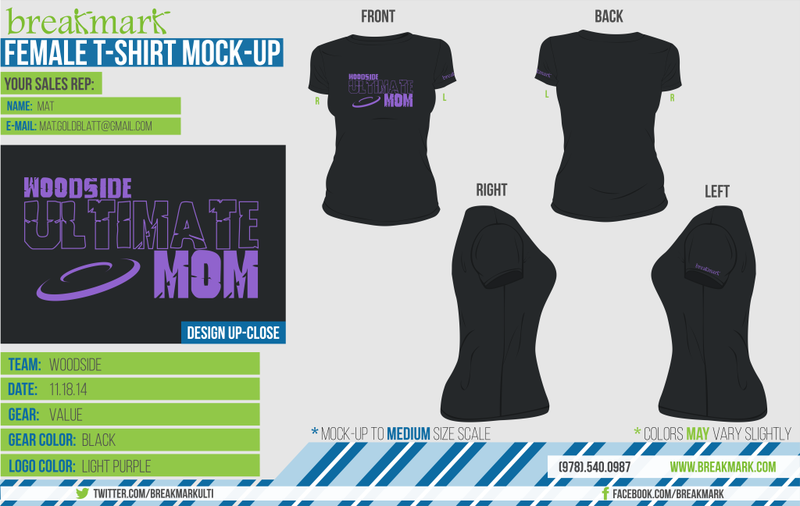 The Woodside Mom Shirt is available now! We need at least 12 to be ordered for them to print. We are cancelling our trip to North Carolina for Sunday. We are having a hard time getting information from the organizers, and there is a high chance of cancellation or shortening due to rain. We aren't going to utilize team funds for an event like that. Stay tuned for details about an indoor event at Woodside in December. This post is an informational update on the NC Tournament. The tournament is now only 1 day, SUNDAY NOVEMBER 23, 2014. If you already booked a hotel please cancel it so you do not get charged. We will drive down very early Sunday morning and drive back in the evening. We are looking for a couple parents who might be interested in attending and driving a couple players with them so that we only need 1 passenger van. Please let the Coaches know or have your player let them know if you plan on attending. We are going to treat this tournament as a developmental opportunity, we will be bringing JV and non-seniors from Varsity first and then supplementing with seniors if needed. These are the X and Y teams for the NC tournament, split this way for all scrimmaging and drills for the next 2 weeks. Each team go over even and odd play calls then Scrimmage to 3 using the calls. Each team go over endzone then scrimmage to 3 with Double Score. Players show this to your parents! We are looking for a couple of items which we could use at Tuneup this weekend. If anyone has an extra pop up tent that we could use please let us know. Also we are looking for a couple folding tables that we could use. In addition to our normal volunteers present throughout the day we need some folks on Saturday to help us pick up pizzas from CiCi's in Hampton. We need 2 folks to pick up the first batch at 2:40pm and 2-3 folks to pick up the second batch at 3:45pm. We will also need a few extra folks at the HQ tent helping serve the pizza from about 3:00pm until we end. Please email us woodsidehs.ultimate@gmail.com or get in touch with Coach Chappell or Coach Richard. Everyone needs to be paying dues, you can pay in parts if needed.